Orbs/Spirits--The Ghost Walk at Madison Hall in Morrisville on Oct 29th was very lively! Are They Orbs, Spirits, Or?????? 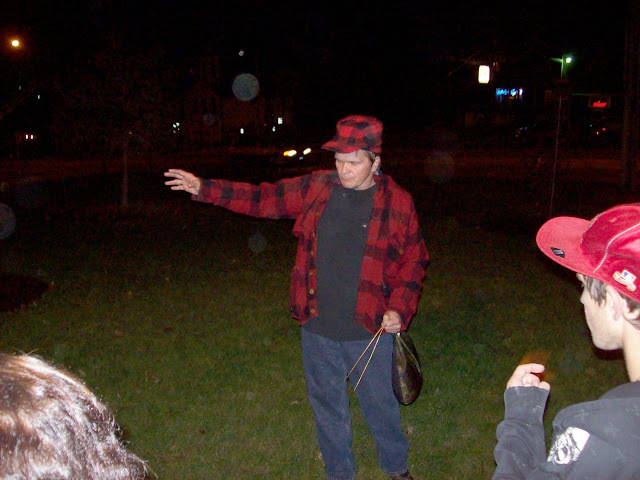 We had a very lively and exciting ghost walk Saturday night (10/29/11) at Madison Hall in Morrisville; it was part of the Madison County Halloween, a fund raiser for the Spirit House Society. Attached you will find a copy of picture taken by a reporter (Mike Jaquays) for the Mid-York Weekly out of Hamilton. Graphic Designer Linda Donaldson of Imagine Design and Spirit House Society Steering Committee has put in some arrows to highlight the many orbs in the picture; the other attached picture does not have arrows. There are several house and car lights in the picture. Madis Senner dressed in a hunter’s costume is standing in front of Madison Hall right next to an earth chakra. Earth chakras (to see a video on earth chakras: http://www.youtube.com/watch?v=XFNzglbm16o) like human chakras are power points where energy is pulled in to be distributed into the physical earth by Mother Earth. As noted in the talk it is at power points such as this where people can feel things, see things and orbs or spirits may appear in pictures. The walk and talk was really more about exploring Mother Earth and the unseen world rather than a traditional ghost walk. People learned and experienced first hand how Mother Earth is often behind our mystical experiences and knowing her features and where to go is critical. Energy points can cause earth lights or give you a dose of energy that can help you see another reality. In other words, during a ghost sighting we are often either seeing an aspect of Mother Earth or we are being boosted by Mother Earth’s geomagnetic field which is empowering us to see another reality. Participants visited many other places in and around Madison Hall. Everyone had a great time, many felt things. Of course everyone smudged themselves afterwards. The Madison County Halloween on Saturday October 29th from 10AM to 8PM at Madison Hall in Morrisville, NY will offer a unique blend of entertainment as well as a chance to chat with local historical associations and learn about Madison County. “We thought it important to bring together local historical associations and historic homes and Halloween provides a great opportunity to do so.” said Madis Senner of the Sprit House Society (SHS) that is organizing the event to benefit SHS. “A Halloween event gives us a chance to add a mysterious and spooky twist that will attract people and hopefully have them learn about Madison County and CNY’s rich history and our local treasures such as Spirit House,” Senner said. Admission is $5. Susan Greenhagen (Morrisville historian) and her sister Dorothy De Angelo will be performing two skits. At 12 noon they will do their entertaining Loomis Gang shtick. The Loomis gang terrorized Central NY in the 1850’s and 1860’s, burned down Madison Hall and lived close to Morrisville. The skit will begin with their video on the Loomis Gang, Frontier Justice, followed by a dressed up Sheriff Bonnie telling the story of the Loomis Gang. At 6 pm, dressed up as Maggie and Kate Fox, they will perform their hilarious light hearted look at Spiritualism. Spirit House was a Mecca of Spiritualism in the 19th century and the Fox Sisters are credited with starting the Spiritualist movement in 1848. See picture below. Doug George-Kanentiio will entertain us with Iroquois Ghost Stories at 3 pm. Hear tales of sorcerers, stone giants and flying heads that are part of the Haudenosaunee Indian tradition. Truly a unique opportunity. As much as Spirit House is shrouded by mystery, so is Louis Muller who escaped Napoleon to Muller Hill within 5 miles of Spirit House. It said that he always had a body guard next to him, created secret tunnels and hiding places fearing that Napoleon would send assassins to America to kill him. Who was Louis Muller? At 5 pm Madison County Historian Matthew Urtz will tell us, and lay the mysteries bare. The Oneida Mansion, the Abolitionist Hall of Fame, Morrisville Historical, the Peterboro Association and of course the Spirit House Society and more will tabling at the event and answering questions. Feel free to ask them questions about their efforts and Madison County history. Talks on Spirit House will take place at 10 am, 2 pm and 7 pm. At 11AM and 4PM two healers from Madison County will provide us with insights on alternative therapies. Skits and talks will take place on the main stage on the second floor. The Madison County Halloween will also feature ghost walks, children’s’ story tellers, a dash of psychics/readers, a pinch of metaphysical vendors and a handful of healers. There will be a silent auction. Fine food and sandwiches made with homemade breads by Red & White Café of DeRuyter; and of course their “monster cookies.” “It’s an eclectic group with a lot to offer, but I guess that is what the Spirit House Society is all about” Senner said.